How does AcuCare Functional Medicine lab testing compare to traditional blood work? Standard blood tests are designed to alert physicians when something is wrong or when a disease process has started. Due to improvements in technology and doctors push to find the “why” behind many disease processes new blood tests are now available to patients. At AcuCare Total Health we are committed to improving the care we offer to our patients with these improvements in technology. Functional Medicine Testing is now available – Let us introduce you to some of these tests so that you can make more informed divisions about your healthcare. 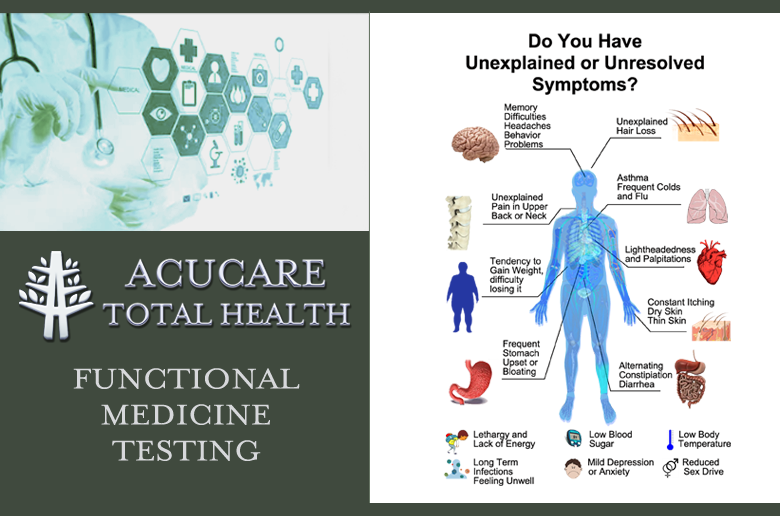 Functional Medicine Lab Tests are an integral and essential part of your health assessment at AcuCare Total Health. These tests give us a clearer picture of your individual physiology and direct the development of your treatment plan. Organic Acid Testing: Provides a snapshot into the patient’s cellular metabolic processes and the efficiency of metabolic function. 74 metabolites including creatine and other micronutrients are analized for central energy production, detoxification, neurotransmitter breakdown, and intestinal microbial activity. Heavy Metal/Essential Element Testing: AcuCare Total Health utilizes 3 different lab tests to ascertain levels of non-toxic metals, heavy metals and mold toxicity. It has been shown that chronic toxic element exposure can adversely affect: your energy levels, susceptibility to cancer, brain function, respiratory, cardiac, liver, and immune functions, and emotional health as well as other degenerative conditions. Systematic Inflammation: The test looks for markers of inflammation throughout your body, giving your Doctor deeper insight into your health, allowing for individualized treatment therapies. Digestive Function Tests: AcuCare offers several different digestive function tests to determine if you have Leaky Gut, IBS, an underlying Gluten Sensitivity or Food Allergy. Part of your digestive analysis may also include a Pathogen Reactivity test to determine if your health is compromised by bacterial, fungal, viral or parasitic condition. Thyroid Panel: A host of health complaints and autoimmunity can be attributed to your thyroid function. This thyroid test is a comprehensive overview of your thyroid hormonal function that is more detailed than a test from your traditional physician. These lab results will help your Doctor manage your treatment protocols and bring welcome relief to your symptoms. If you feel you might benefit from greater insight into the physiological and biochemical interactions to your health, give AcuCare Total Health a call today to schedule your free initial 15 minute consultation. I’ve been a patient at accucare before.